I honestly have no idea why AT&T threat defender exists. At first glance, you may think this is yet another horrible security app pushed out by a carrier, but sadly the actual situation is a lot worse. 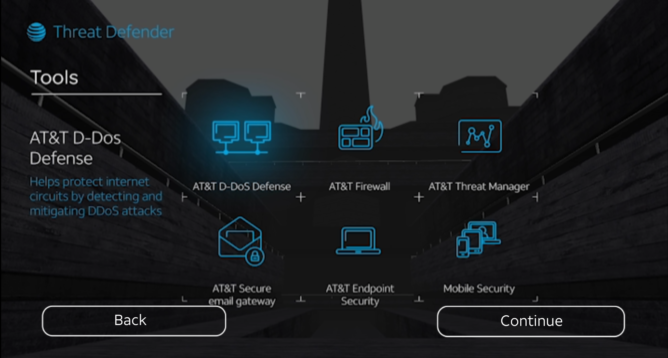 AT&T has essentially created a game out of an advertisement for their security services, and yes it's as bad as you are thinking. It's no coincidence that the very beginning of the game promotes AT&T's security services. In an effort to make their customers aware of the threats that face them online AT&T has pushed out AT&T threat defender to the Play Store. As a concept, I would say it's not all that bad of an idea to gamify learning about internet security, but in practice, AT&T has only delivered something worth pointing at and laughing. Sure there is a semblance of a game within AT&T threat defender, but the fact that it's a buggy mess does no one any favors. In the simplest of terms, AT&T threat defender is an arcade game where you block viruses (and many representations of internet threats) from hitting the screen. This is done by using your finger to move a cursor into the path of these nefarious objects. As you advance, the gameplay will, of course, become more challenging, if you are even able to advance. You see, while the gameplay is pretty uninspired, the broken controls are what really ruin the whole experience. As you can see in a few of the provided screenshots above, the second you lift your finger off the screen there are two cursors displayed. This is not intentional, and it makes playing the game all that more difficult. If that was not enough of an issue, then the fact that the one working cursor doesn't even keep up with your finger movement should show how much of a broken mess this game is. While I will assume the control issues will eventually get fixed, I am still left wondering what in the world AT&T is wasting their resources on. Not only did no one think to actually test the game on an assortment of devices in order to see if it works correctly, but the fact that AT&T thinks it's worth spending their money on what is a useless game no one will ever play leaves me with too many questions. Maybe if AT&T had bothered to create something fun and inspired, I could see their intentions working out for them. But simply releasing shovelware in the name of advertising your services is as smarmy a move as any developer could make. I suppose we can chalk this up to yet another boneheaded decision on AT&T's part, which isn't all that surprising in the end.